Those residents and travelers passing through Pleasant Valley are probably very familiar with the three large paintings that are displayed here each year during the holiday season. These paintings are nativity scenes and have been on display at Christmas time for most years since the mid-1950's. Photo- the paintings are currently displayed on private property across from the Town Hall. Bob Clark, minister at the Pleasant Valley Methodist Church from 1954 to 1957, was instrumental in creating these paintings. Church member Linda Winstead can remember Bob working on the paintings in the community room of the Church. Despite back problems, Bob worked on hands and knees, painting the large canvases on the floor. 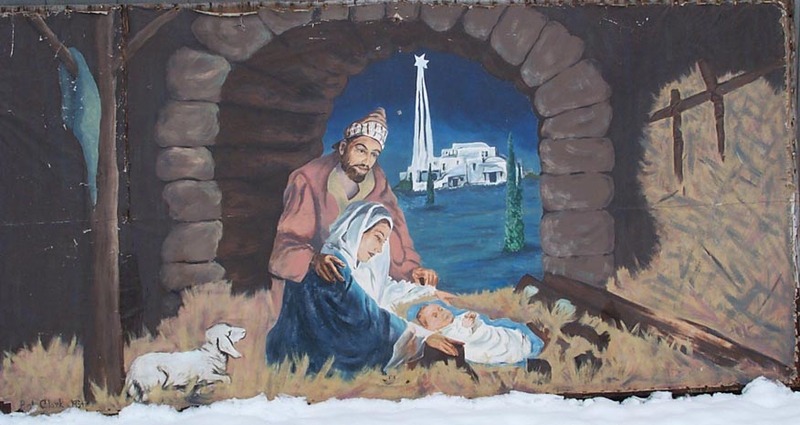 The larger of the three paintings, which shows Joseph, Mary and baby Jesus, is "signed" by Bob Clark and dated 1954 (some feel that Bob was not the type to put his name on the paintings- his name may have been added later by another person). The other two are signed by Bob Clark and Faith Lindsay, and are dated 1956. Bob was a modest person and would tell people that the scenes were merely something he had seen on some old Christmas cards and that the colors used were pot luck from left over house paint donated by church members. In fact he did have artistic talent because one resident tells of the nice line drawings he would quickly sketch during children's sermons at the church. 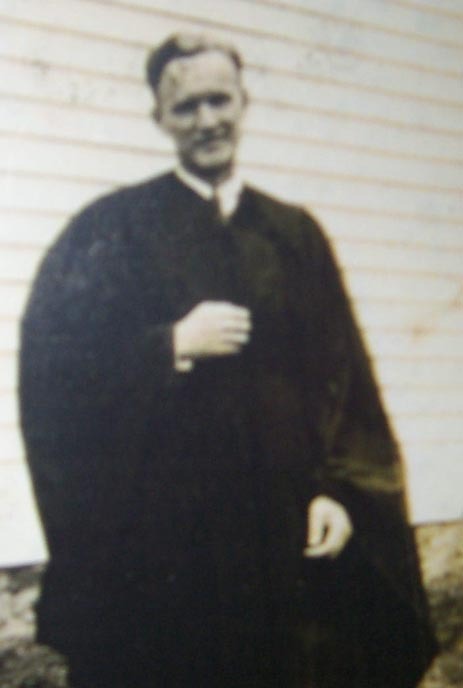 Photo of Bob Clark, taken about 1955. 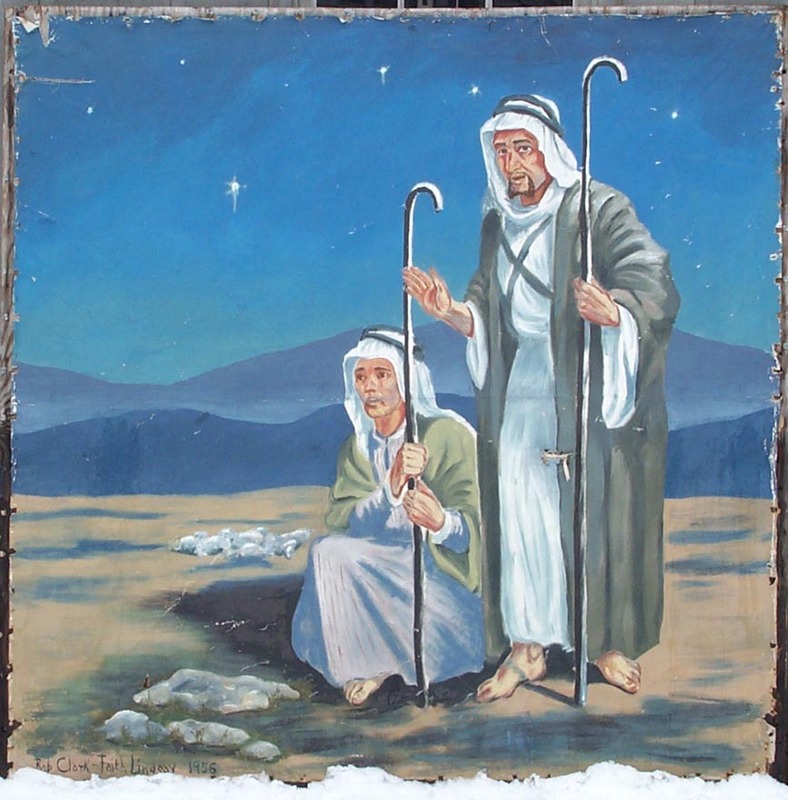 For a few years, the paintings were displayed near the Methodist Church each Christmas. About 1956, the paintings were moved up the street to the corner of Routes 181 and 318 (where the Pleasant Valley General Store parking lot is now) before the store was built there. This was probably done so that they were more visible to pedestrians and passing vehicles at the four corner intersection. When the current Pleasant Valley Store was built and occupied in 1960, the paintings were displayed on the corner across the street (the northwest corner) for several holiday seasons. Then during the mid-1960s the paintings were not displayed for a few years until about 1966 when the Barkhamsted Lions accepted responsibility for putting them up. To this day volunteers from the Lions continue the annual ritual of setting up the paintings. For many years they were displayed in front of the town hall (at that time the town hall was located a couple of hundred feet up Ripley Hill Road from where it is now). Residents fondly remember the display of paintings, the large decorated Christmas tree also located there, and the sound of Christmas carols wafting down from outside speakers at the Ken Church residence located just up Ripley Hill Road. About 1990 a resident pointed out that with the separation of church and state, it was not appropriate for paintings of a religious nature to be displayed on town property. To maintain the tradition, the Lion volunteers found a new location on private property across from the Town Hall where they are currently displayed. Despite being outside and uncovered for about a month each year, the paintings are still in fairly good shape. About 1976 they were refurbished by Pleasant Valley resident Joanne Bachman. Hopefully the paintings will continue to stand up well and be enjoyed by residents and travelers for at least another half century!